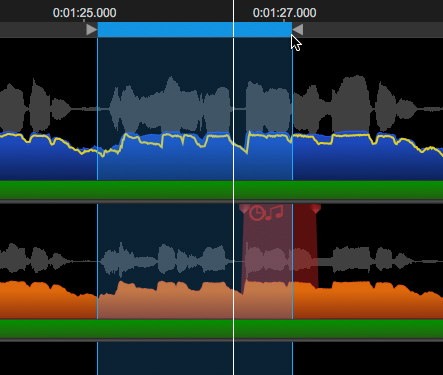 To set a Playback Range, click and hold down the Left Mouse button in the Playback Range Track and drag cursor to the right (or left) to create the Playback Range - shown in the picture below by the temporary highlighted area between vertical blue end markers. When the mouse key is released – the block will be set in place as shown below. The ends of the resulting Playback Range block can be trimmed by placing the cursor on the triangles at either end, hold down the Left Mouse button to get the extended blue end markers as shown in the first image above. 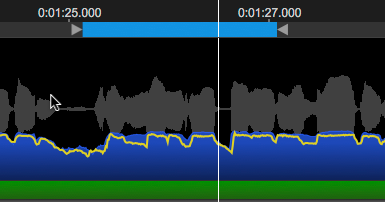 Drag the selected start or end of the Playback Range to the desired location(s). Using the mouse as described in (1) above, you can insert a new Playback Range block in an empty area of the Playback Range Track, that will replace the current one. A Playback Range can also be inserted by highlighting a group of notes or pitch blocks in Warp or APT output displays and pressing the Y key on the computer keyboard.